The Kickeroo Kitten is the ultimate toy for growing cats. It stimulates your kitten's playful behaviour and hunting instinct. 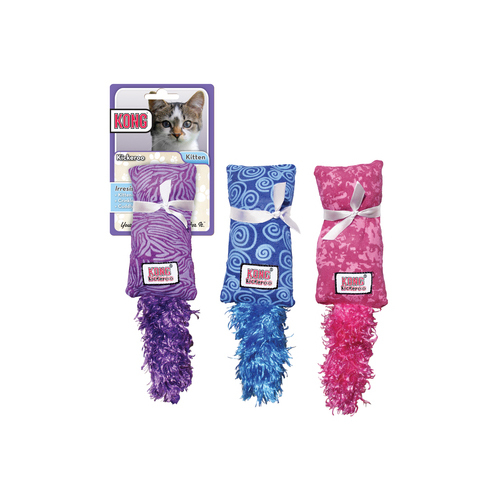 The catnip and crinkling noise make this toy even more attractive to your kitten. With the Kitten Kickeroo from KONG , your kitten can play for hours. The toy makes a crunchy sound while playing and is filled with catnip, which is very appealing to cats. Thanks to its fuzzy tail, the Kickeroo looks even more like real prey. This stimulates the hunting instinct. This cat toy is available in various bright colours. For adult cats, we also have the Kong Cat - Kickeroo. The catnip cannot be refilled. You can spray the Kickeroo with Catnip Spray from KONG . This product is delivered at random, you cannot select your colour. You will receive one Kickeroo. Have you used KONG Cat - Kitten Kickeroo before? Let us know what you think about this product.